News today from VSoft Technologies, publishers of FinalBuilder, that their companion product Automise is featured on Bits du Jour today at a whopping 90% discount. Bits du Jour is a "One deal a day" website that features software products. Today's deal is Automise for $19.50 against a regular price of $195.00. VSoft Technologies describes Automise as "very similar to FinalBuilder but aimed at Sys Admin, Network Admins and other IT professionals. It's got the power and ease of use of FinalBuilder, but is cheaper and lacks the developer specific stuff (like compilers, version control systems, etc)." FinalBuilder is a powerful tool for software developers to automate the process of building their software release packages. I've been using FinalBuilder for several months now and it's become one of those indispensable products you wonder how you ever got along without. Looks like Automise could be equally useful, and you certainly can't beat today's price. Footnote: Bits du Jour has an RSS feed at http://bitsdujour.com/blog2/wordpress/?feed=rss2. When I blogged recently about my favorite extensions for Firefox, I mentioned four that were not compatible with Firefox 2.0. 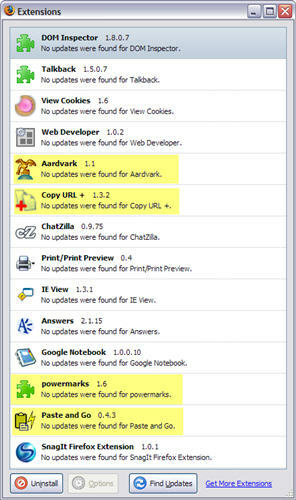 One has now been updated: Powermarks 3.5 Build 387 is available for download and is working fine with Firefox 2.0. Today when I launched QuickBooks Pro 2007, it prompted me to install an update it had automatically downloaded. The update ran normally for a while, but then at a point where it was running something in a visible command window, the command window showed that three items failed to run because they were "not recognized as in internal or external command." The three items are Components\QBAgent\QBMsgMgr.exe, Components\QBAgent\qbdagent2002.exe, and axlbridge.exe. This was followed immediately by a File Copy Failure dialog containing the message QuickBooks failed to update all files because some of these files are being used by QuickBooks and its related components. Please re-start your computer and run "postpatch.bat" in the QuickBooks application directory. Don't you love it when this kind of stuff happens? Nothing related to QuickBooks was running at the time, save for the update itself and the QB automatic update detection process, which always runs. Hard to believe that would interfere with an update, but at this point that was my only guess. After re-starting the machine I killed the QB automatic update detection process, ran postpatch.bat and encountered the same error. So contrary to the original error message, the problem is evidently not related to files being in use by QuickBooks. I inspected the batch file and found that it registers several components, then tries to register the three files mentioned above. Fortunately, these three are grouped together in a section of the batch file commented as Needed for Payroll feature, which provided the clue to the reason for the failure: I don't have the payroll feature installed. A quick check of the QuickBooks application directory confirmed that these three files are not present on my machine, which of course explains the error. While this turned out to be relatively minor annoyance, it cost me some time and is something Intuit should have caught in testing before releasing the update. Fortunately, it appears the rest of the update installed correctly. If you've installed Outlook 2007 but declined to install the optional Instant Search feature, Outlook continues to prompt you to enable Instant Search by displaying a clickable banner beneath the currently open folder name. You can remove this banner by unchecking the "Show prompts to enable Instant Search" checkbox under Tools ¦ Options ¦ Other ¦ Advanced Options. Jensen Harris has published some Developer Resources for Office 2007 RTM. Harris notes these resources will eventually be available on MSDN but you can get them now via his blog. The first post has links for the Control ID list (in Excel format) and the CustomUI schema. Thanks to TheServerSide.NET for the link. Harris is Group Program Manager of the Microsoft Office User Experience Team. Another valuable resource I noted on his site is The Office 2007 UI Bible, an organized list of links to his various posts on the why's and wherefore's of the Office 2007 user interface. Looks like good reading. I took a deep breath and installed Office 2007 as an upgrade on top of Office 2003 this afternoon. Since I rely on Outlook for a lot of things I hedged a little and backed up up my .pst files first, but other than that I decided to just fire up the installer and see how it went. Answer: it went very smoothly. And unlike Craig Berntson's experience, no reboot was required (although Craig had a beta previously installed and I didn't, which might be the difference). The only glitch with a 3rd party product I've seen so far occurred when I first fired up Outlook. Outlook advised me the avast! Outlook/Exchange plugin had a problem and asked if I wanted to disable it. I said yes and Outlook came up normally, after which I was able to start the Outlook/Exchange provider from the avast! menu. Looks like a trip to the avast! support forum is in order for this one. On the other hand, my Qurb spam blocker continues to work in Outlook 2007 with no problems, which was a big relief because Qurb was absorbed by CA some time ago and is no longer supported under that name. The new ribbon control in Word, Excel, etc. is going to take some getting used to, but probably not as much as I'd initially thought. And although I like blue as much as the next person, the default blue color scheme was immediately too much for me. Changing it to silver was easy, though, which put it more in line with my XP color scheme and made me a happy camper again. I'm sure there's a lot to learn here, but so far so good. Next step: testing Office 2007 automation from VFP. FeedDemon 2.1 has been released. Like most of Nick Bradbury's software, this version has been through several betas and release candidates, so it should be really solid. There are about four printed pages of new features, changes, and fixes to explore and enjoy. The release notes and download link are at www.bradsoft.com/feeddemon/readme/. Over on his blog this morning, Garrett Fitzgerald notes that the entire suite of Sysinternals utilities is now available as a single download from Microsoft. Let me echo Garrett's comment here: "Grab them whether you think you'll need them or not: sooner or later, you will." One of the great things about the Firefox Web browser is the wealth of 3rd party extensions available. I've grown to rely on several that make using Firefox easier and more convenient for me. The screenshot below is a list of my personal favorites; if you're interested, click the image for a more readable size. One of the downsides of relying on 3rd party extensions, though, has become apparent after the recent release of Firefox 2.0. Although FF2 has been available for a couple of weeks now, some of my favorite extensions have yet to be updated to work with it. Of course, there was never any guarantee they would be, and given that they're all free to begin with there's really no room for complaint here, but while I enjoy the improvements in FF2 I miss the convenience these extensions provide. 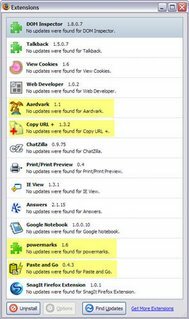 As of this morning the list of laggards includes the following: Copy URL +, Paste and Go, Aardvark, and Powermarks. I hope they'll be updated to work with FF2 in the near future.